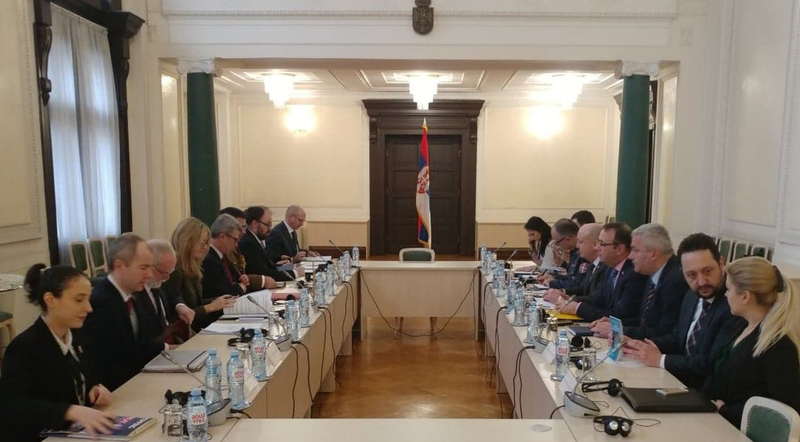 Bilateral consultation in the field of security policy and defence (Strategic Dialogue) between the ministries of foreign affairs and defence of the Republic of Serbia and the United Kingdom of Great Britain and Northern Ireland was held in Belgrade on 5th and 6th February 2019. The Serbian delegation was led by Aleksandar Živkovic, State Secretary in the Ministry of Defence, and Ambassador Branimir Filipović, Acting Deputy Minister of Foreign Affairs for Security Policy, while the delegation of the United Kingdom was led by Jill Gallard, Deputy Political Director at the Foreign & Commonwealth Office and Nick Gurr, United Kingdom Ministry of Defence Director for Euro-Atlantic security. During the meeting, both sides expressed a strong commitment to working together in the direction of strengthening bilateral relations in the field of security and defence policy and all other areas of common interest, as well as the efforts to continuously deepen mutual understanding in this format. Both sides welcomed the renewal of this consultation/strategic dialogue and the opportunity to exchange views on a wide range of foreign policy, defence and security issues. The relevant ministries of both countries aim to strengthen the cooperation between Serbia and the United Kingdom through holding meetings in this format, and the next round of consultation/strategic dialogue will be held in London in the second half of 2019. In the open discussion they considered a wide range of issues related to regional security and regional cooperation in addressing security challenges, with the common assessment that peace and stability is a key precondition for the economic and other progress of the region as a whole. Opinions on the current situation in Kosovo and Metohija were exchanged and it was noted that the dialogue between Belgrade and Pristina is the only way to reach a compromise and sustainable solution that contributes to regional stability, while refraining from taking unilateral acts that cause enormous damage to this process. In addition, other issues of global, European and regional security were considered. In particular, the issues of bilateral relations and cooperation in the field of security and defence policy were discussed, emphasising the need for further intensification of ministerial dialogue and meetings at all levels, as well as the interest of both parties to further promote economic cooperation as an extremely important segment of the overall bilateral relations.